I normally have some (canned) preserved food in home for those days I run off of fresh ingredients, or where simply I’m too lazy to cook. A special preserved food I like are the squids in american sauce, if they were lovely canned imagine if you can cook them at home. Well they become gorgeus and a fantastic choice to bring to work/school on a tupper, and even you can preserve them on the freezer. Start grating one onion, you can wear diving glasses to avoid crying … Then grate 4 tomatoes, cut them on half and grate each part until there is only the skin in your hands. 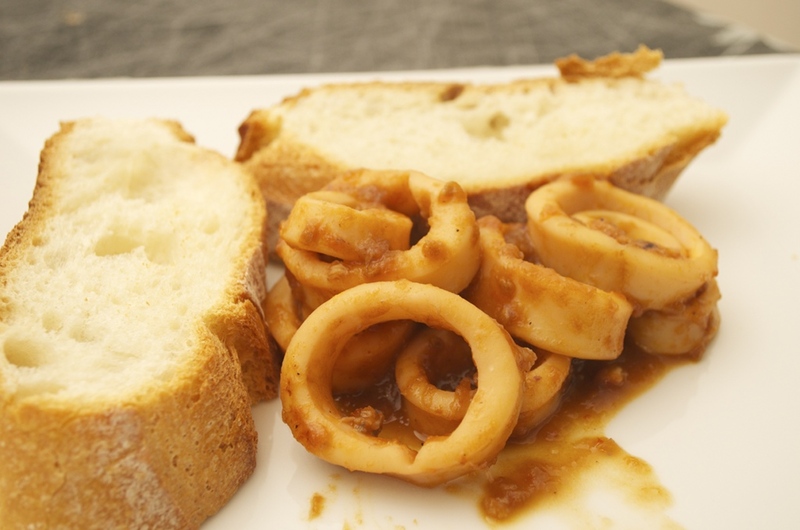 Cut the squid in rings. In a pot tall enough add a bit of olive oil and the grated onion, add also a bit of salt, ground pepper and stir some times. Cook until the onion starts to get golden. Then add the tomatoes, about 5 crushed garlic cloves and some chopped chili if you want it spicy. Keep on fire until the water of tomato is mostly evaporated, and stir frequently. Add one glass of white wine and cook again until is mostly evaporated, adding then one cup of brandy. 3 minutes later add the squid, mix well and add a bit of salt, cover the squid with water and cook about 35 minutes with the pot covered with a lid. If you want the squid softer you can cook them about 45 minutes. Finally remove the lid and cook with the fire at maximum until the sauce gets as dense as you like, stiring to avoid the food get stuck to the pot.